This is not the only connection between the Church of Scientology and the supposedly non-religious New Life Detoxification Program, which according to the Church's website is "a secularized adaptation of the Purification Rundown" used by Scientologists ["What is the Purification Rundown?" - <http://faq.scientology.org/page11c.htm>]. One of the books accompanying the Scientology purification programme is a title called Purification: An Illustrated Answer To Drugs. It is in fact virtually identical to the Narconon picture book, despite the fact that one is supposed to be religious and the other secular; the text is almost the same, the pictures are the same and the pages are the same - even the pagination is the same. The only significant differences are that every mention of Scientology has been removed, and the name "Purification Rundown" has been replaced systematically with "New Life Detoxification Program". The picture book has no contents page but the publication information page has some intriguing disclaimers and copyright statements. Both the picture book and Clear Body Clear Mind are copyrighted by the L. Ron Hubbard Library, a business alias of the Church of Spiritual Technology. (See, for example, document number V3439 P886 in the Library of Congress's database of copyright items at http://www.copyright.gov/records/cohd.html; the record refers to "Church of Spiritual Technology, conducting its affairs under the name L. Ron Hubbard Library".) The involvement of the Church of Spiritual Technology is not explained by Narconon, nor even referred to in its literature. Nor, curiously, does the Church of Scientology explain it either; the organisation is only mentioned once in passing in the whole of the official Scientology website and is not referred to at all in the website's description of the Church's organisational structure (at http://www.scientology.org/world/worldeng/corp/index.htm). This is despite the fact that the CST owns and governs the use of all of L. Ron Hubbard's works, fiction and non-fiction alike - the Church of Scientology website includes an obligatory "grateful acknowledgement to L. Ron Hubbard Library" but never actually explains what that body is. Nor, it seems, do any of the Church's dozens of other websites. This book ... is presented to the reader as part of the record of [L. Ron Hubbard's] personal research into life, and the application of same by others, and should be construed only as a written report of such research and not as a statement of claims made by the author or organization. Any verbal representations made to the contrary are not authorized. The New Life Detoxification Program cannot be construed as a recommendation of medical treatment or medication and it is not professed as a physical handling for bodies nor is any claim made to that effect. There are no medical recommendations or claims for the New Life Detoxification Program or for any of the vitamin or mineral regimens described in this book. This seems to be a bizarre thing to say considering that both detoxification courses are supposed to rid the body of drug residues and other toxins - surely a "physical handling" if ever there was one. The reason is that during the 1950s and 1960s, the Church of Scientology ran into a lot of problems with Federal and state authorities in the United States for practicing medicine without a licence, leading to court cases, confiscations and convictions. It was, for instance, not very prudent for Hubbard to promote Scientology as a cure for polio, cancer and radiation poisoning, which not surprisingly led the U.S. Food and Drug Administration to take legal action against the Church. Since then, the Church has been careful to claim that physical benefits are merely an accidental but fortunate possible side-effect from Scientology courses. Officially, the Purification Rundown is supposed to be about spiritual benefit, or as Hubbard puts it, "to meet a growing threat to mental and spiritual advancement and well-being". However, this policy breaks down fundamentally when applied to Narconon. 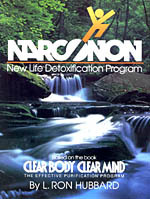 According to the official Narconon website, the programme deals "with the physical and mental problems brought about by drug use" - italics added for emphasis ["New Life Without Drugs", <http://www.narconon.org/narconon_rehabprogram.htm>]. "Spiritual" is hardly appropriate for a secular rehabilitation programme. Yet the disclaimer still rejects the possibility that the programme has a physical aim - so what is the point of doing it if it doesn't have one? On a related issue, the first disclaimer attempts to weasel out of the obvious fact that, as we shall see, supposed miracle cures are being advertised for everything from chemical toxins to drug residues and even to radiation exposure. In fact, when the text of the picture book is examined carefully, it becomes apparent that it has been carefully worded so as to appear to report claims rather than make them. The book is published by Bridge Publications, Inc. of Los Angeles. This happens to be the Church of Scientology's publishing house; as its website (at http://www.bridgepub.com) illustrates, it is the publisher of L. Ron Hubbard's Scientology and Dianetics works. His works of fiction are dealt with by a different corporation, Author Services Inc. (http://www.authorservicesinc.com). Everything they publish is, however, formally owned by the "L. Ron Hubbard Library", i.e. Church of Spiritual Technology. Note that this effectively sets the author up as being infallible; the possibility that something might not make sense because it is inaccurate or untrue is not deemed to be a factor. Hence, when Hubbard claims later in the picture book that the effects of past X-rays can be sweated out of the body, anyone having trouble with this proposition is falling foul of a misunderstood word rather than the fact that the proposition itself is impossible. A"Doctor's Evaluation" is provided on the next page. It comprises of an extract from an academic paper, "Evaluation of a Detoxification Regimen for Fat Stored Xenobiotics" [see <http://www.detoxacademy.org/pdfs/fatxeno.pdf>], published in a non-peer-reviewed journal in 1982. The co-authors were Dr Gene Denk, Dr. Megan Shields, Stephen Brunton and D.w. Schnare (although for some reason the last is not credited in the picture book) and sponsored by the Foundation for Advancements in Science and Education (although this is also not mentioned). Denk is a Scientologist who was L. Ron Hubbard's personal physician in the years immediately before Hubbard's death. Shields is also a Scientologist who is Narconon's medical research director and one of the Hubbard programme's most prominent supporters. The Foundation for Advancements in Science and Education was established in 1981 with the explicit purpose to "research the efficacy of and promote the works of L. Ron Hubbard in the solving of social problems; and to scientifically research and provide public information and education concerning the efficacy of other programs", according to its incorporation papers, although the mention of L. Ron Hubbard was later removed. These facts are, of course, not mentioned either in the picture book or in the original paper. Denk's introduction finishes with a statement that "the theories presented in this book are gaining increasing acceptance among medical doctors and scientists". This is an exaggeration at the very least; in fact, only a handful of such individuals - often Scientologists or linked to Scientology-related groups - have publicly supported Hubbard's detoxification programme. It is, at best, only a fringe therapy and has little if any credibility in the medical and scientific community in general. The main part of the picture book, about 70 pages long, consists of a series of fairly amateurishly drawn cartoons accompanied by brief text from L. Ron Hubbard, apparently excerpted from Clear Body Clear Mind. The first few pages show the grim effects of drugs but assure the reader that "there is hope for changing this - on the New Life Detoxification Program." In the Scientology version of the book, Purification: An Illustrated Answer To Drugs, "New Life Detoxification Program" is replaced by "Purification Rundown". This type of replacement occurs systematically throughout the book. Alongside a cartoon of a man suffering an LSD flashback (right), Hubbard announces that he has made a startling discovery: that LSD flashbacks are caused by the drug becoming trapped in the body and spontaneously being released at later times. In fact, LSD does not crystallise in the body. It is a water-soluble substance and is flushed out through the body's own natural processes in three days or less. This makes Hubbard's explanation of LSD flashbacks physically impossible. The general opinion among psychologists is that LSD flashbacks, also known as hallucinogen persisting perception disorder (HPPD), are a phenomenon akin to the post-traumatic stress disorder (PTSD). In that instance, an intense emotional experience - such as being in a battle or a disaster - can be "relived" on later occasions. There is evidence to suggest that both LSD and PTSD flashbacks have their roots in activity in the part of the brain known as the locus ceruleus and can be treated with clonidine-based medications [see Lerner et al, "Clonidine Treatment for Hallucinogen Persisting Perception Disorder", <http://www.stormloader.com/hppd/clonidine.htm>]. After around 20 pages of dire warnings about the effect of drugs, the picture book turns to the New Life Detoxification Program itself. It describes the various stages of the program, starting with the medical tests. The wording is taken from Clear Body Clear Mind but with some changes. Whereas Hubbard warns in that book that "Anyone with a weak heart or who is anemic or who suffers from certain kidney conditions should not do this program", the Narconon picture book warns that it "should not be undertaken by anyone who has a weak heart or is anemic". Kidney problems are mentioned later, however; people with such issues would do "a much lighter program ... worked out with a medical doctor". That doctor will invariably be a Scientologist - a fact which in itself poses risks, given the demonstrable willingness of Scientologist doctors to put Hubbard's claims above their own medical training or, indeed, the whole of medical science. Prior to starting the Purification program, I had a history of moderately heavy radiation exposure. This consisted of long periods of sun exposure through childhood and college and frequent X-ray exposure from working around X-ray machines with patients for some seven-odd years. I had no physical problems or complaints upon starting the Purification program. My drug history had been very light. Prior to starting the program, I had a history of moderately heavy radiation exposure. This consisted of long periods of sun exposure though childhood and college and frequent X-ray exposure from working around X-ray machines with patients for some seven-odd years. During the program I had several episodes of extreme flush, splotchy rashes accompanied by nausea and a very solid, wooden feeling. At times, there was an electrical kind of discharge from the body especially to the arms and hands. Interesting enough, after the program I realized several low-grade somatics that I previously had ignored were gone. Small things, like occasionally unexplained nausea or mild aches in the muscles and joints. Consequently some attention is freed from the body and the above somatics have not particularly reoccurred in the two years since finishing the program. From my viewpoint as a physician, this raises several questions on what effects low-grade radiation of different types over a lifetime can have on a being or his body - probably more significant than is currently recognized. GD. During the program I had several episodes of extreme flush, splotchy rashes accompanied by nausea and a very solid, wooden feeling. From my viewpoint as a physician, this raises several questions on what effects low-grade radiation of different types over a lifetime can have on a being or on his body - probably more significant than is currently recognized. - G.D. Prior to the Purification program something was wrong. Objectively, I was acting analytically but from time to time subjectively I would experience psychosis and neurosis in specific areas of my life which tended to hamper me as a being. I am an ex-Marine who had fought in the Vietnam War from 1968 to 1969. Besides the constant fighting, I also was exposed to deadly poisonous gases and toxins, especially Agent Orange and some sort of nerve gas, while in the service and in the Vietnam War. Through the Purification program these toxins were fully flushed out. They had actually prevented me from thinking straight and logically inhibited my perceptions and control of my body. Boy, was I ever in for a surprise during the program and after completion! I was exposed to deadly poisonous gases and toxins, especially Agent Orange and some sort of nerve gas. They inhibited my perceptions and control of my body. I literally erased an incident which had me stuck on "the track," dramatizing it in present time, that I wasn't aware of. I had considered my environment dangerous - I mean really dangerous as it was in the jungles of South Vietnam. But would you believe that I was still "in" South Vietnam though I left it in 1969? I was fully brought out of it as well as oriented to my present environment by the Purification program. It really undercuts everything. I mean, these were such very simple actions to do but powerful insofar as the results and gains I had. Both objectively and subjectively, the Purification program has changed my life, my physical well-being and my attitude towards a much better existence of survival. I no longer have to look over my shoulder for "the enemy" (which wasn't there) or walk carefully through any grassy areas (looking for land mines which don't exist) so that I can five another day. It has opened a door for me - a door through which I can experience life. My physical being is much better insofar as its coloration and pigment. Many other people have commented on how healthy I look I feel healthy and I am aware that I am in control of my body which had been hampered prior to the Purification program by those toxins, especially Agent Orange. As a Vietnam vet, I can say that life is definitely worthwhile to experience and create. There is hope for those Vietnam vets who are still in the Vietnam War syndrome after being out of the war. WB. From then on I considered my environment dangerous. On the program I was brought out of that. These toxins and gases were fully flushed out. I feel healthy and in control of my body. Now life is definitely worthwhile to experience and create. I can say that there is hope for Vietnam Vets. - W.B. This has been a truly fantastic program. I had many and various diseases, maladies, aches and pains and symptoms turn on and disappear, and I am grateful to feel physically sound and able to take care of a body. But I think the most spectacular gains were not physical. I feel brighter, more enthusiastic about life. My memory has improved. I don't feel confused or jumbled up. I'm sure I will be able to study better, too. B.K This has been a truly fantastic program. I had many and various maladies, pains, aches and symptoms turn on and then disappear. But the most spectacular gains were not physical. My memory has improved. I feel brighter, more enthusiastic about life. - B.K. The systematic nature of these changes is worth noting. In every case, there is no indication that the success stories actually relate to the Purification Rundown rather than the Narconon programme. The first success story (which, although this isn't declared anywhere, is actually from Dr. Gene Denk, who wrote the introduction to the picture book) redacts any mention of the Purification programme, "electrical discharges" or "somatics" - the latter is a neologism coined by Hubbard which means physical symptoms. The second success story similarly redacts mentions of the Purification programme but also omits the explicitly Scientological details given in the original account. Its author mentions "the track" - short for "time track", a key concept in Scientology. As the Scientology website describes it, the "time track" is a consecutive record of "mental image pictures" from this and past lives, which "could be likened to a motion-picture film, if that film were three-dimensional, had fifty-seven perceptions and could fully react upon the observer." ["A Description of Scientology: Survival and the Mind" - <http://www.whatisscientology.org/Html/part02/chp04/pg0145.html>] It is a concept which is exclusive to Scientology and has no discernable scientific basis whatsoever. The third success story doesn't mention the Purification programme in either version, but the Narconon version makes a very significant redaction - the author's claim that "diseases" were "run out" is deleted, as are the claims that the programme has enabled him or her to "feel physically sound". This presumably is incompatible with the book's opening disclaimer that "it is not professed as a physical handling for bodies nor is any claim made to that effect". A notable oddity is that the author of one success story declares that he has gained great benefits from doing the programme even though he was "without a drug history" and so "expected to gain little from the program". As Narconon is by definition - even down to its very name - a drug detoxification programme, why are people who are not drug abusers undergoing the programme? The picture book does not mention any of the associated risks, but it does include a rather worrying series of pictures (right) of people suffering pain and distress as a result of taking niacin overdoses. Hubbard's text claims that these are "simply the results of niacin interacting with niacin deficiencies which already exist in the cellular structure". This is totally incorrect and amounts to little more than gibberish: niacin actually has the effect of stimulating the release of histamine from skin cells, producing the same kind of reddening and itchiness as seen in rashes and allergies. As the body's supplies of histamine are exhausted, the intensity of the reaction diminishes. There is no sign from Hubbard's writings that he knew about histamine release, even though it was a well-established medical fact when he came up with his theories on niacin and radiation. This highlights another potential hazard of Narconon's basis in Scientology. Those who administer the therapy are invariably either Scientologists or ex-clients of Narconon (and often both), and are trained to have absolute faith in Hubbard's claims. Indeed, the "integrity of Source" - as Hubbard is known by Scientologists - is a fundamental dogma of Scientology. When applied to the medical matters of which he so obviously had little understanding, it is a potentially disastrous dogma; if there is a clash between medical science (which says that niacin overdoses and very long sauna sessions are dangerous) and Hubbard (who says they aren't), then "Source" will automatically win the argument - even if he is provably wrong. Another illustration of Hubbard's ignorance of biochemistry (and for that matter, anatomy) is provided on the following page. A crude diagram (left) shows niacin supposedly "breaking up and unleashing" drug and chemical deposits, including the non-existent LSD crystals, within the tissue in a subject's arm. This, not for the first time, shows Hubbard's lack of knowledge of biochemistry. If one did want to stimulate the release of fat into the bloodstream, niacin is useless for the task - as an antilipidemic agent, it actually blocks the release of fat. Moreover, the diagram shows the arm as being effectively a homogenous tube of flesh. Of course, it isn't; like any limb, it is a complex system of skin, veins, fatty tissue, muscle and bone, each element of which behaves in distinct ways biochemically. Some radioactive contaminants, for example, will bind themselves to muscles and bones; niacin, even if it could mobilise fat, would do nothing to affect the other components of the arm. Narconon clients are required to drink oil (actually a mixture of four oils - soy, walnut, peanut and safflower - which must taste as foul as it sounds) in pursuit of another failed theory of Hubbard's. He states that "some oil is taken every day to encourage the body to give up its bad, drug-laden fat in exchange for the good oil", alongside a diagram of a blackened lump of fat being replaced in a cell by a clean white piece. In fact, oil is not required at all to make fat; it can be synthesised perfectly well from carbohydrates, and Hubbard's theory has (according to Dr. Mark Palmer) "no documentation or basis in fact". Over the next couple of pages, Hubbard recommends a gruesome concoction dubbed "Cal-Mag", a mixture of vegetable oil, vinegar, calcium, and magnesium which he claims to have developed in 1973. Its aim is supposedly to "handle and prevent deficiencies", "help rebuild cellular structure", "keep the nerved smoothed out" and "help prevent sore muscles". In fact, Cal-Mag was the invention in 1954 of Adelle Davis, in a book entitled Let's Eat Right To Keep Fit which has deservedly acquired a degree of notoriety for its numerous scientific errors (on average, about one per page). Davis was a hugely successful "food faddist" who claimed to be able to stave off cancer by drinking large quantities of calcium-rich milk; fate showed its sense of morbid humour when she died of cancer in 1974. (See the excellent Quackwatch website for a summary of Davis' dubious legacy - <http://www.quackwatch.org/04ConsumerEducation/davis.html>). Hubbard was certainly well aware of her - in HCO Bulletin of 7 March 1980, "Diets, Comments Upon", he declared that "The most useful published, popular compilations on the subject of diets and biochemistry to date were done by the late Adelle Davis in her four books: "Let's Get Well", "Let's Eat Right To Keep Fit", "Let's Cook It Right" and "Let's Have Healthy Children"." Perhaps one should not be surprised to find one pseudoscientist citing another. The remaining dozen pages of the cartoon section of the picture book are devoted to the supposed "miraculous cures" obtainable through the Narconon/Scientology detoxification programme. It is worded in a most curious way, following the model used by Hubbard in Clear Body Clear Mind. The claims made are remarkable - that radiation, nuclear fallout and even Agent Orange can be sweated out of the body. However, the claims are merely "reported" by Hubbard rather than stated outright. (This assumes that Hubbard did not simply make up the "reports".) Each "report" is supported by a "success story" which describes the anonymous author's delight to have overcome the effects of drug/radiation/toxin exposure. It is never actually said that the programme will cure a specific problem (including drug addiction); every account is along the lines of "it has cured my problem". This careful use of tenses - statements of past efficacy rather than promises of future cures - is no doubt prompted by Scientology's legal problems following its promotion in the 1950s of cures for radiation poisoning, which brought down the wrath of the U.S. Food and Drugs Administration. Whether the current approach would stand up to determined legal scrutiny is anyone's guess; there may be no explicit promise of a miracle cure, but Narconon/Scientology pushes implication to the limits - there certainly is not much ambiguity about what is being offered.